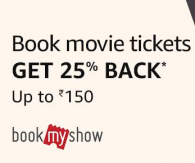 Get 25% cash back upto 150 /- on BookMyShow if paid via Amazon Pay .You can now use your Amazon account to buy movie tickets. Browse our partner movie ticket booking apps & sites to explore all movie showtimes & movie offers. Book online movie tickets and experience one-click purchase using Amazon Pay balance or access your saved cards to save time & get 100% buyer protection against all your orders. Amazon Pay is now accepted on all popular movie ticket booking apps & websites like BookMyShow, JusTickets, TicketNew & more.You can follow the below steps to buy this product at their deal price.Keep Visiting dealsheaven.in for more Best offers ,hot online deals, promo code, coupons and discount . BookMyShow Amazon Pay RS 150 Cashback Offer details.